The Weird Recycling Center, located on the first floor of Popp Martin Student Union, provides the campus community an opportunity to recycle unique items. 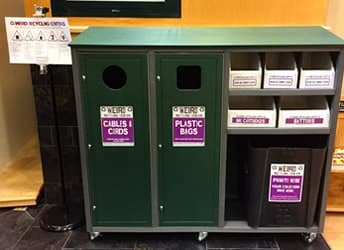 Funded by the Charlotte Green Initiative, the Weird Recycling Center accepts items such as plastic bags (which must be clean, dry and empty) and unwanted cords, cables, batteries and ink cartridges. The center also provides an opportunity for student organizations to host donation collections for other unique items. Faculty and staff already have the opportunity to recycle many of these items in their offices. Last year, about 12,000 pounds of batteries and 4,600 pounds of ink cartridges were recycled. The idea behind the Weird Recycling Center is to provide students the same opportunity and decrease overall landfill usage. The center is a collaboration among the Office of Waste Reduction and Recycling, the Sustainability Office and the Popp Martin Student Union. The campus community is encouraged to submit ideas to the Charlotte Green Initiative for funding. Student organizations that wish to host a donation collection at the center should contact the Student Union Information Desk.